FPT shoots the breeze with Moby on his new album- Innocents, post-modern collaboration, the hindsight of Play, Christmas on steroids, and the tyranny of the physical product. FR: So, do I call you Moby or Richard? MOBY: Well, I've been called Moby since I was born. The story I've been told by my parents was that- before I was born- they decided I was going to be Richard Melville Hall if I was a boy. Then they looked at me after I was born and decided that was too big of a name for a little baby. So, as a joke, they nicknamed me Moby- and for my entire life, I've been called by my innocent-joke nickname. FR: Alright. Moby it is. Innocents is out October 1 and the entire worldwide tour will comprise the weekend of October 2-4. Why such a consolidated set of shows? MOBY: For a few reasons. First and foremost, I've realized as I've gotten older that life is fairly short. My favorite thing is to be in my studio working on music. And the problem when I go on tour is that I'm not able to be in my studio working on music. I'll never complain about touring because there's certainly nothing wrong about traveling around the world playing music- but when I go on tour, I sort of stop being creative. And given the choice between sitting in airports and hotels and not being creative or sitting at home and being creative... I'd rather work on music. So that's honestly one of the main reasons. There's also another slight reason. When I first started touring in 1990 and 1991, I had this experience where I was in London Heathrow Airport and I saw this band- I don't remember who they were- but they were middle-aged and tired and kind of dumpy. You could tell they'd been on the road forever. They looked just kind of sick and unhealthy- so I vowed to myself that I would never become that. But then I found myself years later at London Heathrow... looking middle-aged, tired, and dumpy. I realized that I had become what I had vowed to never become. Maybe in the future I'll tour again but life is too short to keep doing the same thing over and over and over again. FR: With each show divided into two performances of greatest hits and newer material, I'm reminded of my own two Moby experiences. The 9:30 Club in support of 2009's Wait For Me featuring new material prominently and two years later at 2011's Moogfest which focused on the familiar hits. Why is it important to shift focus with two different shows? And do you think this is a model more long-lasting performers may possibly adapt to? MOBY: I guess it's trying to figure out how to play new music that might not be that interested as well as older music that- as far as I can tell- is the reason people would pay money to buy a ticket. Some bands just refuse to play older songs and then some bands only play older songs- so I saw this as a way to pay honor to the new music on a new record without irritating people in the audience too much. I'm sure we've all had the experience where we've gone to see our favorite band and you're there to hear your favorite band playing your favorite songs and- for whatever reason- they only choose to play the music from the new record. When I go see bands and they do that- honestly, I'm kind of disappointed. FR: Innocents is being described as your most collaborative record yet. That's a bold statement as you are indeed no stranger to collaboration. How do you feel the idea of collaboration in music has evolved since your earlier days? MOBY: First off, it's become a lot easier because in the "ye olden days" of the late 80s and the early 90s, records were made on tape. In order to collaborate with someone, you had to ship tapes around- they were heavy and you had to rent a big studio with a 2" tape machine and now you can just send ProTools files or Logic files back and forth so now it's just easier logistically. And also, my belief is that we live in this age of expanding eclecticism and I think that one of the reasons why people are so eclectic now is because music doesn't always cost anything. In the 70s, 80s, 90s, listening to music meant going out and buying a $20 CD or an expensive record. People had to be almost confined in their taste because music cost a lot but now with Pandora, Spotify, these streaming services, people can be very eclectic and it doesn't cost them anything. I think that's made a lot of musicians more open to collaboration than they would have been twenty years ago. FR: For example, I saw earlier this week that Alt-J had taken a stab at remixing the first single from Innocents "A Case for Shame". MOBY: Yeah, I asked them to do it. One of the most wonderful things about remixing is that you can get someone to do a remix and- especially now- it doesn't really cost anything to make a remix so they can be completely experimental doing whatever they want and it doesn't affect the original song. It's not like other art forms where if someone wanted to remix a painting, the painting would be destroyed. With music, the original recording isn't affected in the slightest. FR: Speaking of "A Case for Shame", was this your first experience directing a music video? Have you ever thought about directing a movie? After all, a lot of your catalogue feels like the soundtrack to a movie only the listener can see. MOBY: To be honest, I had actually directed one music video before-- for Mercury Rev. FR: Wow. I didn't know that. MOBY: It was 1996 or 1997. But this last one was the first time I had ever directed any of my videos. With the Mercury Rev video- it's called "Young Man Stride"- I don't even know if anyone ever saw it. So with this video- honestly, I just felt that I had some cameras at my house and I invited a bunch of friends over and it was this open, relaxed, fun, creative afternoon where I dressed up my friends in masks and sheets and then shot them. It's kind of the exact opposite how we made music videos in the late 90s where you had like a four-day shoot that would cost as much as a house in suburban New York. FR: On the same note, I remember that you provided the score for that batshit crazy Richard Kelley movie, Southland Tales, some years back and I found myself wondering when/if you would be doing any more musical work for film? MOBY: I've contributed songs to lots of people's movies. I've worked with Danny Boyle, Paul Haggis, Michael Mann, Oliver Stone, but usually that's just giving a director a song or two. As far as doing a whole score for a movie, I don't know. The only thing that really interests me is writing a film score for a more experimental, unconventional movie which is one of the reasons I loved working with Richard Kelley. Southland Tales is certainly unconventional. It's interesting because that movie was almost universally loathed when it came out. I think the only positive review it got was in New York magazine and the review consisted of the journalist saying "this movie is batshit crazy and we don't know if it's good or bad but it's certainly worth watching". FR: That's exactly how I feel about it. It exists unto itself. MOBY: Yep. It's developed a cult following over time. But I'd much rather do a weird, idiosyncratic music score for a weird, idiosyncratic movie that might never be seen instead of doing a generic score for Madagascar 3 or something. FR: What licensing use of your music do you find most evocative? Which one has best reflected your original emotion? Has any licensing adaption surprised you in its interpretation? MOBY: When Michael Mann used the song "God Moving Over the Face of the Waters" at the end of Heat, that one was the one I was most surprised by. It felt like such a perfect marriage of music and film. At that point, I hadn't really licensed that much music so I hadn't been as involved. So I went to the theater and had no idea if I was going to be hearing five seconds of the song or ten seconds and the fact that the song ran for five-and-a half minutes... it was one of those personal and professional moments that felt like Christmas on steroids. It was just so exciting. As a musician growing up, I never expected anyone to listen to the music that I made. I never expected to have a record contract. I never expected to have a career as a musician. So when things like Heat happen, it's so exciting because it's contrary to anything I ever expected for myself. I really thought that my life was going to be spent teaching community college and making music that no one would ever listen to. FR: Heat was like Christmas on steroids for people in the audience who obviously didn't write the music so I imagine it had to be pretty elating. MOBY: Yeah. It's this quantifiable feeling. At that moment, I knew that other people were actually listening to my music and I'd never expected it. It was a really wonderful moment. FR: There seems to be a continuum of sampling styles, from going over-the-top like Girl Talk to the subtleties of Burial. Where do you see your own work on this spectrum? Do you build songs around samples, or find the sample for the song? 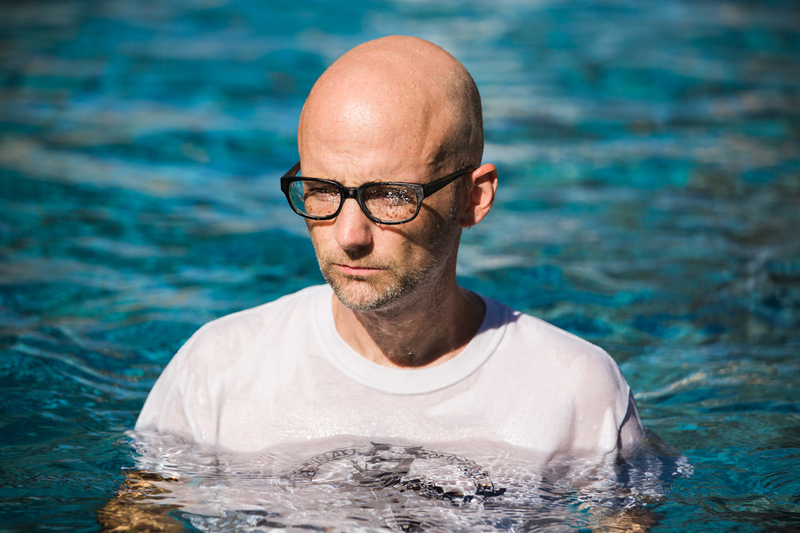 MOBY: As a musician, my goal is- to be reductionist about it- is really quite simple. I'm trying to make music that I love and I'm never too concerned about what the compositional elements are. I'm not concerned what genre I'm working in. I'm not concerned who's singing. So I guess I'm very- in a weird way- emotionally utilitarian. I'm trying to write music that affects me emotionally without being too concerned with how it's written or what it's comprised of. I started using samples simply because I'm not such a good singer and I realized that, if I wanted to have interesting vocals on my record, I had to work with other singers and work with vocal samples. Also, samplers really came to prominence in the late 80s. At the time, it seemed like the most exciting records I was hearing were made with samplers so it just made me want to jump in. But Girl Talk and Burial? Aesthetically, my sensibilities are more in line with something like Burial but- at the same time- if it was Friday night and I was on a date, I'd rather go to a Girl Talk show. FR:A Burial show would be pretty cool too. MOBY: A Burial show would be great on a Monday night by myself. But... Friday night, on a date... I guess the only danger at a Girl Talk show would be your date ending up on stage and you never seeing them again. FR: Myself- as well as many others- have often directly cited Play as the album that held hands across the bridge as the idea of what one's relationship with music could be shifted into the new millennium. How do you remember the Play experience? Did it seem that pivotal a moment as it was happening as it does in hindsight? MOBY: When I was making Play, I was convinced it was going to be a complete failure- and I'm not just saying that in a self-deprecating way. The album before that- which was Animal Rights and I loved- had been a complete failure. So I was making Play and hoping Daniel Miller would release it almost as a favor to me. But I didn't expect it to be successful at all. The first show we did for the release of Play was in a record store in Union Square and I think like eighty-five people came and I thought that the fact that I could get eighty-five people to come to the basement of a record store and listen to me play was pretty impressive. When it went on to become so weirdly successful, every aspect of it was surprising to me. FR: One of my favorite aspects of your discography are the diverse influences in your work- from punk to gospel to funk to ravecore- is there a current artist you find yourself drawn to? MOBY: I guess probably James Blake. I don't know that much about him. As far as I can remember, I first heard about him when he signed to Warp Records. I thought of him as an electronic musician but when I heard his version of the Joni Mitchell song, "A Case of You", I just loved the weirdness and the diversity and eclecticism of his approach to music. With the most recent album he made, I love that he's made this soulful music using a lot of unconventional but traditional elements. FR: The music industry has really gone sideways in the past fifteen years from Napster to iTunes to Pandora to Spotify and beyond. The way people are encouraged to listen as well as experience music has changed and you've had a front row seat to much of this evolution- we touched on that a bit already. But where do you see the music scene going in the next fifteen years? MOBY: That's a really good question. I don't know if I have an equally good answer. It does seem- and I'm hesitant to say this because I love buying vinyl and I love listening to albums- but all indicators point to a future based around music streaming which certainly doesn't mean the end of the album. But it does mean that there may be a time in the near future where it seems anachronistic for people to own music. Friends of mine are already experiencing that. They'll get Spotify or Pandora and suddenly they'll get so excited to have way more music at their fingertips than they could ever consider owning. It's certainly not the most insightful thought because everyone else in the music business recognizes that streaming is the future. The fact that music production is less expensive as well- for the longest time, music production was expensive- now though it costs nothing to make music. Pretty much all you need is software on your laptop and I only see music production getting more egalitarian. FR: Is it difficult producing an album knowing that so many people have instantaneous access to thousands of songs as opposed to when you were producing Animal Rights or even Play where you knew that people would buy the CD and that CD would be the music they had for that hypothetical day? MOBY: There is a part of me that loved the tyranny of physical product- cassettes, vinyl, CDs. It was nice because if someone bought your CD, there was a good chance they would listen to the whole album. But, at the same time, everything has changed and it would be a futile effort to complain. I read some interview with Thom Yorke- and of course I love Thom Yorke and I love Radiohead- where he was complaining about Spotify and to me that just seems like you're complaining about aging or bad weather. There's literally nothing you can do about it. And with bad weather and aging, the best thing you can do is just accept it and make the most best out of it and see the positive in it. So when I think about how easy it is to make music and how easy it is to listen to music- on one hand, I think it's wonderful because it means that music has become such a ubiquitous art in so many people's lives. Of course though- when I make an album- I do have that presumptuous hope that at least a few people may listen to the album from start to finish. Listen: RAC Releases Original Track, "Let Go"
Yuck Share New Single, "Middle Sea"
Watch: Phosphorescent - "Ride On / Right On"
Listen: Haim's Newest Song - "The Wire"